Want to hear a story about heartbreak mixed in with important bits on grooming? Here it is. Every foster has one: the one dog that got away. Mine was little Blossom. 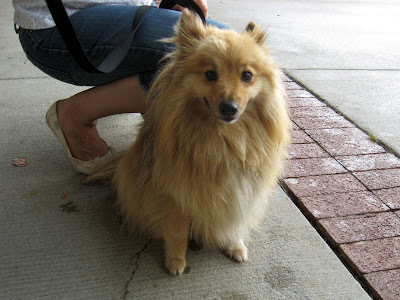 Part Sheltie, part Pomeranian, she had a way of leaning against you when she wanted attention and picked up on how things worked after just one go. No heavier than 15 pounds, she came to the rescue, like so many other dogs, as a stray. Somebody obviously lost her in the rural wilderness of Virginia on the border with Tennessee, but why that somebody never looked for her will remain a mystery. Going off just one picture, I agreed to take her in, but by the time I arrived to take her home, I discovered a creature quite different from my expectations. She actually smelled, was extremely matted, and displayed a clear “stay-away-from-me” attitude. Nancy, my wise foster coordinator with HART, suggested I get her groomed. Don’t get me wrong, I am all about keeping animals clean and their nails trimmed, but I didn’t really see how focusing on this dog's vanity could help me overcome bigger issues. Nonetheless, I went along with Nancy’s suggestion. There was no saving Blossom’s tangled lion’s mane, so the groomer shaved it all off rather close to her skin. When I returned to pick up the little diva, I honestly didn’t recognize her. When the fur is not washed or brushed it turns into a kind of a furry helmet around the dog that, in turn, doesn’t allow the skin to breath, which bacteria and fungus call paradise. This is the reason some dogs and specific breeds of cats get groomed so often: it’s the best defense against skin bacteria and fungus issues. What was truly amazing is that Blossom’s personality drastically changed with her haircut. She calmed down and seemed to trust the world again. She actually ... smiled at me now. 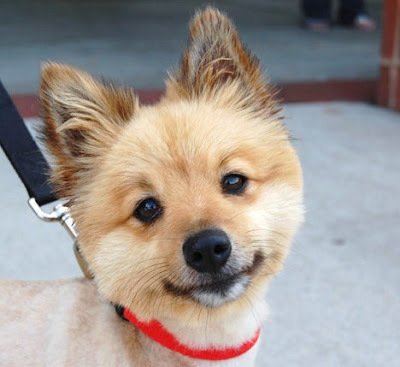 (Man, I have a thing for smiling dogs.) And even though I was not her actual fur helmet liberator, she bestowed many a grateful looks and hugs on me anyway. Being part Pomeranian made her very keen on her human companionship. Unlike working or sporting group dogs, toys have had ample time to figure us humans out, so they resemble people in their behavior when they get comfortable. Everyone knows how smart Lassie was being a Collie, now imagine a smaller version of the same breed, called Sheltie. This breed is known for their listening and learning abilities and Blossom turned out a perfect combination of the two. In fact, I enjoyed her company so much it broke my heart when she was quickly adopted. As the new family lead her away, she kept turning her little head to look for me and getting on her hind legs to seek me out in a crowd. So when people ask me if giving up a foster dog is hard, I always think back to that very moment. I miss them all in different ways, but I still miss my little Blossom most of all.